Exclusive content only available to VIP newsletter subscribers, such as excerpts or additional unpublished content. Special giveaways available only to subscribers. Advanced notification for new releases. A special place in the author’s heart. Good luck and thank you for subscribing! The fine print: Eligible for residents of the United States and Canada only. Amazon gift card is only redeemable at Amazon.com (USA). The newsletter subscriber giveaway ends at 11:59 p.m. (CDT) on Monday, May 25, 2015. Winners will be notified via email, smoke signals, or carrier pigeon. If you have any questions, feel free to post it in the comments or via the contact form. A few days ago, during my interview over at An Author’s Ramblings, I announced that I’m going to have a PUMPKIN CARVING CONTEST to test your knifing skills. I want to thank Patty Allread at My Cooking Life for this fun idea. Many of you are probably already planning on hitting the pumpkin patches anyway, so why not also enter your Jack-o-Lantern into a contest? If you think you have what it takes to carve the coolest or scariest pumpkin, then I challenge you to participate. You’ll slice up your pumpkin and post a photo of you with your work of art to my Facebook author event page HERE or via Twitter HERE. Be sure to name your pumpkin (used for voting purposes) and include the hashtag #DevilsNightmarePumpkins. DEADLINE for submission is Saturday, October 18. I’ll then compile all of the submissions and then include them in a blog post on Monday, October 20 where the public will be able to vote for the best pumpkin carving. Voting will end on Sunday, October 27 and I’ll announce the winner on Halloween. I know this questions is burning on your mind now: So, what does the winner get? First of all, EVERY PARTICIPANT IS A WINNER, because everyone who carves a pumpkin and enters the contest will get a FREE Kindle version of my Amazon bestselling horror Devil’s Nightmare. If you don’t have a Kindle, you can still read it with a free Kindle reading app available for multiple devices HERE. 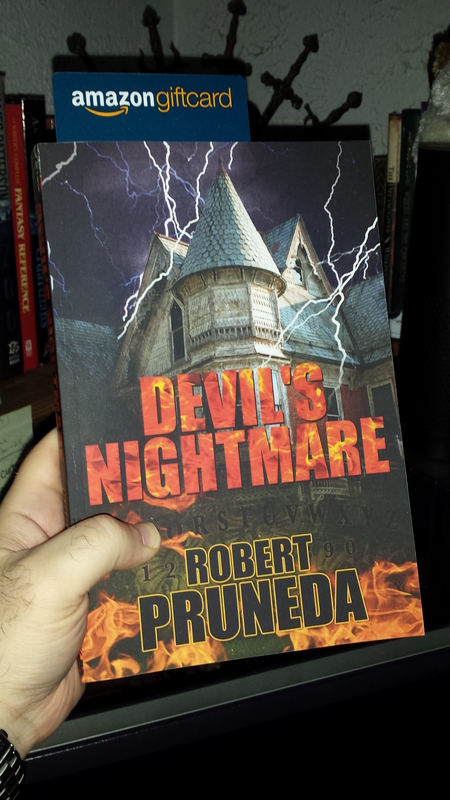 One random participant will also win an autographed copy one of my books. That’s awesome, but what about the grand prize? What does the person with the coolest pumpkin carving get? I’m a starving novelist, so no trips to Las Vegas or big screen TVs are up for grabs. 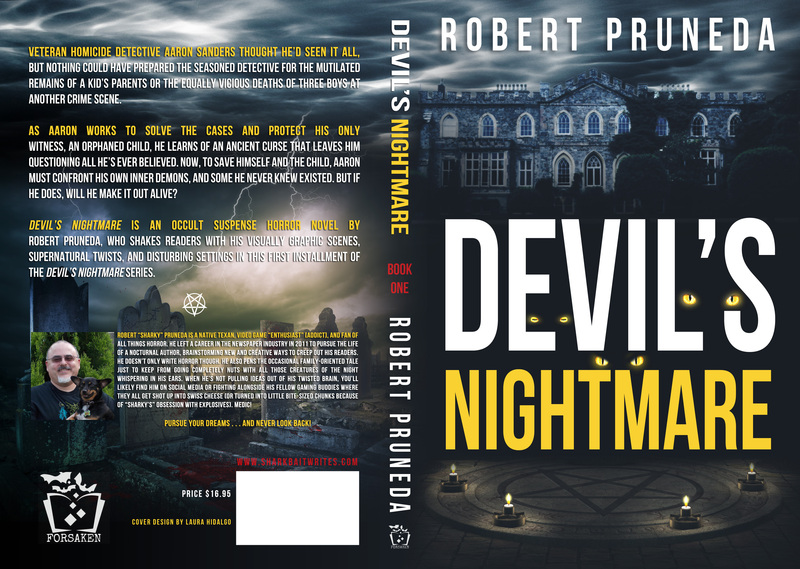 However, I will be giving the winner a signed and personalized copy of Devil’s Nightmare and Devil’s Nightmare: Premonitions. Plus, you’ll have the pride of knowing your pumpkin was selected as the coolest pumpkin in the world! So, what are you waiting for? Start slicing up that pumpkin and post those pics! I look forward to seeing what you all submit.